Do you have a rheumatic, autoimmune, or musculoskeletal condition that needs treatment in Raleigh, NC? At Triangle Arthritis & Rheumatology Associates, we specialize in arthritis treatment that puts the patient first. Our office features a highly-qualified staff with the expertise and experience to focus on the treatment of rheumatoid arthritis, osteoarthritis, and more than 100 other types of rheumatic conditions. Regardless of your age, or the severity of your condition, we have the knowledge to offer you the expert advice on diagnosis and treatments you need to improve your health and overall quality of life. 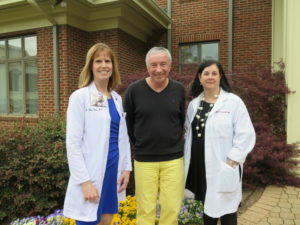 When you arrive for your first appointment at Triangle Arthritis & Rheumatology Associates in Raleigh, you can expect one of our dedicated rheumatologists to take the time to carefully evaluate your symptoms and specific joint problems in efforts to craft a treatment plan to suit your individual needs. In an effort to make your experience with us an enjoyable one, we have uploaded all of our patient forms and policies to our patient information page for you to print off and fill out prior to your first visit. You can also read up on your condition and treatment options on our patient education page. Our comfortable suite is equipped with spacious and relaxing recliners and is fitted with Wi-Fi. During treatment, you will be cared for by our well-trained team of infusion nurses. Making you feel comfortable and cared for is important to us at Triangle Arthritis & Rheumatology Associates. As such, we strive to offer the highest quality arthritis treatment in Raleigh. With our caring and experienced physicians, we partner with you to help you manage your rheumatic conditions–not just your concerns. If you are interested in learning how Triangle Arthritis & Rheumatology Associates can treat arthritis in Raleigh, Durham, Chapel Hill and the surrounding areas, give our office a call at (919) 881-8272 or contact us online. 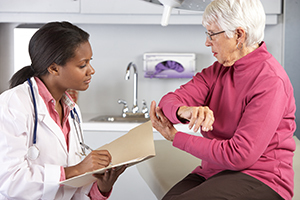 If you’re ready to make an appointment with one of our arthritis specialists, fill out the form to the right, and we’ll set up a time for you to come in. At Triangle Arthritis & Rheumatology Associates, we treat arthritis and rheumatologic conditions with specialized care for patients in and around the Raleigh, NC area, including those in Durham, Cary, Chapel Hill, Garner, Apex, Morrisville, Holly Springs, Fuquay-Varina and beyond. Our office is conveniently located on 3101 John Humphries Wynd behind the Harris Teeter Shopping Center at Olde Raleigh Village in Raleigh, NC.